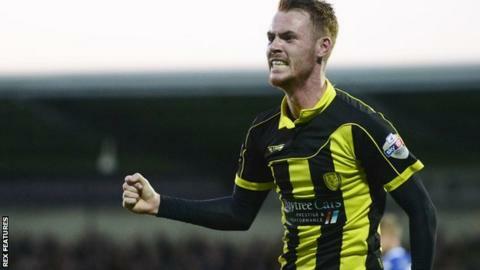 League One leaders Wigan were held to a draw by second-placed Burton. Wigan took an early lead when Michael Jacobs sent in a cross that evaded everyone and found the far corner. Nigel Clough's side levelled before the break when Tom Naylor rose highest to head home Matty Palmer's free-kick. Wigan remain three points clear with three matches to play while Burton are still three points above third-placed Walsall, who fought back to draw 1-1 at home to Swindon on Tuesday. The Saddlers have a game in hand on Burton, who need one more point to secure a play-off spot. Gary Caldwell's side host Southend on Saturday while the Brewers visit relegation-threatened Colchester. "I thought we were magnificent all the way through, start to finish. "We were very unlucky to go one-nil down tonight at home, but once again the response was excellent. "Deserved the equaliser and all the second half, we could have got a goal at any time because we deserved it, the way we went about it. "In terms of making it uncomfortable for the opposition, getting in their faces, closing down and doing those sorts of things then yes it was one of the best performances of the season." Match ends, Burton Albion 1, Wigan Athletic 1. Second Half ends, Burton Albion 1, Wigan Athletic 1. Callum Reilly (Burton Albion) is shown the yellow card for a bad foul. William Grigg (Wigan Athletic) wins a free kick in the attacking half. Corner, Wigan Athletic. Conceded by Robbie Weir. Substitution, Burton Albion. Callum Butcher replaces Tom Naylor. Attempt missed. Chris McCann (Wigan Athletic) left footed shot from the centre of the box is too high. Attempt missed. Mark Duffy (Burton Albion) header from the centre of the box is just a bit too high. Substitution, Burton Albion. Robbie Weir replaces Hamza Choudhury. Substitution, Wigan Athletic. Donervon Daniels replaces Reece Wabara. Mark Duffy (Burton Albion) wins a free kick in the defensive half. Attempt missed. Stuart Beavon (Burton Albion) right footed shot from outside the box misses to the right. Max Power (Wigan Athletic) wins a free kick in the defensive half. Chris McCann (Wigan Athletic) is shown the yellow card. Hand ball by Jason Pearce (Wigan Athletic). Substitution, Wigan Athletic. Haris Vuckic replaces Michael Jacobs. Jason Pearce (Wigan Athletic) wins a free kick in the defensive half. Hamza Choudhury (Burton Albion) wins a free kick in the attacking half. Hamza Choudhury (Burton Albion) wins a free kick in the defensive half. Substitution, Burton Albion. Callum Reilly replaces Tom Flanagan because of an injury.